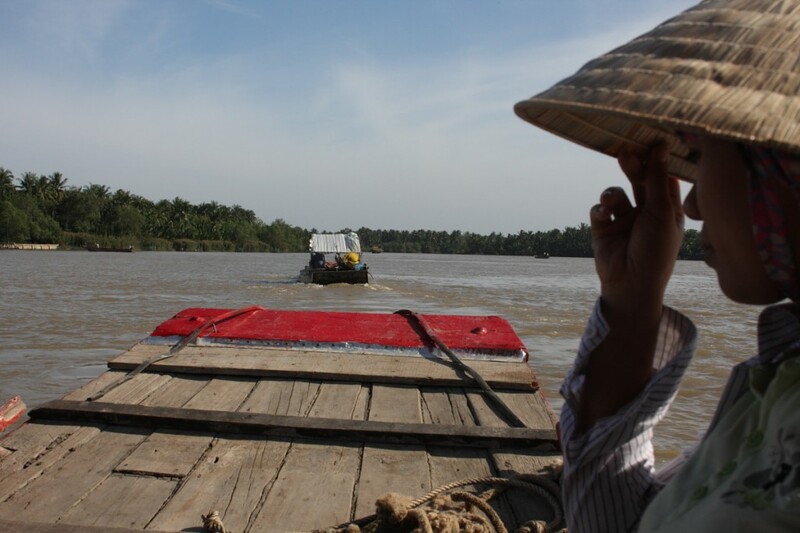 Headed off yesterday to the Mekong Delta the food basket of Viet Nam, a maze of waterways and islands just an hour or two outside of Saigon. The are is fantastic a hive of activity both industrial and traditional with Sampans chugging their way trough the maze carrying rice and coconuts, wood or bricks it appears t all moves by water and water is the lifeline of the community. The homestay was just fantastic out among the channels and the palms, took a cycle ride through the maze of little pathways and get thoroughly lost, mmm yes but we left a trail of bread crumbs mmmm not !!! only took an extra hour to find our way back. Had some crazy woman trying to give directions in Vietnamese and the less we understood the more she gestured with her arms flailing in the air and the universal if they don’t understand speak louder, but overall the locals are great people very friendly with a smile and a wave. The food was really good and we even had the locals sing for us which was mmm interesting, not the most melodic but tuneful. Our little tour guide we had was well cute and very sweet; think I might have to come back.